Have you ever thought about how prayer and faith work? I know I have been praying for all the years of my life that I can remember (which puts us at 50+) and I still wonder how it all works! The prophet Daniel, who's story is found in the Old Testament of the Bible, prayed and kept praying for 21 days. After 21 days an Angel showed up and explained that an evil spirit had delayed him coming. What if Daniel had STOPPED praying after the first day? Would the Angel still have showed up? Daniel 10: 12-13 Then he continued, "Do not be afraid, Daniel. Since the first day that you set your mind to gain understanding and to humble yourself before your God, your words were heard, and I have come in response to them. 13 "But the prince of the kingdom of Persia was withstanding me for twenty-one days; then behold, Michael, one of the chief princes, came to help me, for I had been left there with the kings of Persia. Is the Lord moving on our circumstances dependent on our praying about them? Where then is Faith? How do faith and action work together? James 2: 14 - 26 What good is it, my brothers and sisters, if someone claims to have faith but has no deeds? Can such faith save them? Suppose a brother or a sister is without clothes and daily food. If one of you says to them, “Go in peace; keep warm and well fed,” but does nothing about their physical needs, what good is it? In the same way, faith by itself, if it is not accompanied by action, is dead. If we stop praying, will God STOP working in our lives? Shadrach, Meshach and Abednago had FAITH that God would save them. What if they had obeyed in refusing to worship the Kings false idols but their FAITH had wavered? What if just ONE of them had doubted? Would they still have been saved from the fiery furnace? When David faced Goliath, suppose the first rock hadn't felled the giant? Would David have had the gumption to throw a second one? He had, after all, picked up 5, not just one. Is prayer about getting God to move on our behalf? Or is prayer about getting US aligned with Gods truth? Mark 9:24 "immediately the father of the child cried out and said "I believe, Help my unbelief!" We know that the words we speak are powerful weapons. How powerful are the thoughts we think? What about the feelings we experience? Does how we feel also impact our world? I know from the story of Hezekiah in the Old Testament that our powerfully emotional pleas reach Gods ears and DO MOVE His heart on our behalf. In those days Hezekiah was sick and near death. And Isaiah the prophet, the son of Amoz, went to him and said to him, “Thus says the Lord: ‘Set your house in order, for you shall die and not live.’ Then Hezekiah turned his face toward the wall, and prayed to the Lord, and said, “Remember now, O Lord, I pray, how I have walked before You in truth and with a loyal heart, and have done what is good in Your sight.” And Hezekiah wept bitterly. Right about now is where most people would expect I will reveal my "5 steps to putting faith into action" or "3 Ways to pray for the greatest answers". Faith is about the heart before God, and each of us is individual in our hearts. As long as the basic elements of truth as laid out by Jesus are in evidence, see Matthew 6: 9- 13, it is certain from the examples in the Bible and in the lives of many millions of Gods children over the years of history that indeed, PRAYER operated in FAITH by a heart humbled before the Lord, works miracles. Some receive answers quickly. For others it takes times. Some get the exact answer they want, others get the answer that is better for their circumstances than they were aware of. But all who call upon the name of the Lord and pray get answers. And isn't that the actual point in the first place? To know we are not alone, we are not forsaken, we are not without hope. combined with prayer is one of the most powerful sources in all the Universe that God created. Soaring with the ..... GEESE? Geese fly in a V formation, which adds 70% more strength and flying time on average to the flock as a whole than any goose flying singly. The reason is because as each bird flaps its own wings it creates an uplift wind for the bird following behind. When we share common goals, attitudes and morals we build a sense of community. Everyone gets what they need most - relationship - and we all get where we are going individually quicker and easier. 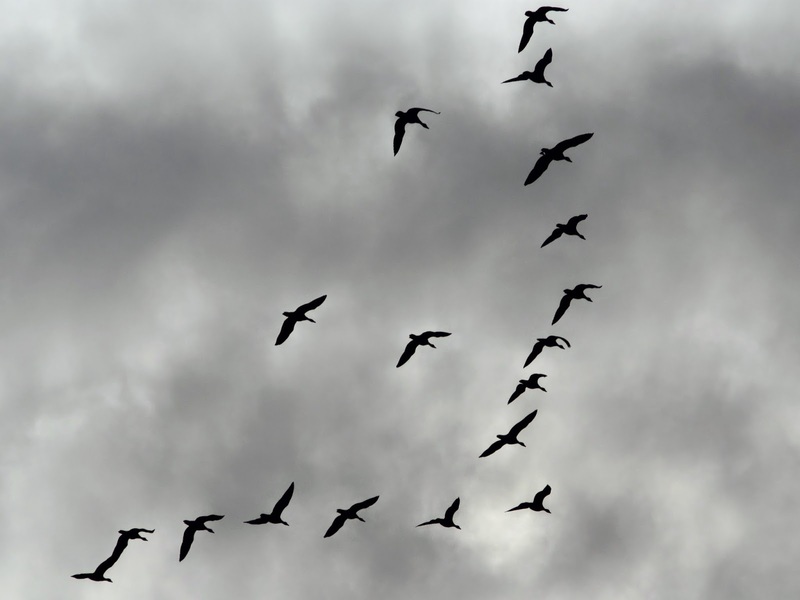 Every time the current goose leading the formation begins to tire, it simply falls back to the end of the V, where it is refreshed and strengthened. Another goose naturally steps in and assumes the leadership position, bringing with it the reserve strength from being further back in the formation. When we all take responsibility to shoulder the lead at intervals instead of the same one at all times, our interdependence upon one another never becomes too heavy a load that one is always bearing alone. 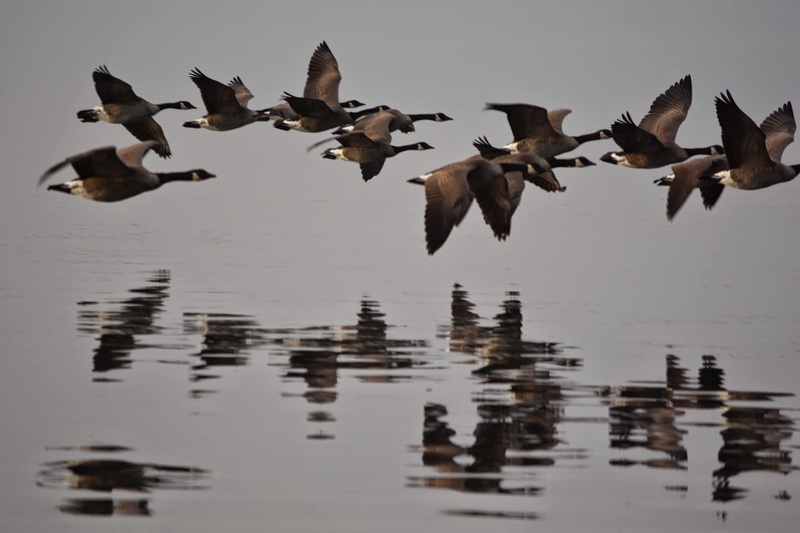 Whenever one goose does get it into its head to abandon the formation, the sudden drag and resistance of that solo flight remind it of the advantage of being lifted by the power of the formation and it swiftly returns. Lending our strength to others strengthens us. Flying solo saps our strength until we are simply burnt out and cannot continue. The geese in formation constantly honk encouragement one to another, and let those currently in the lead know they are there and ready to take over when they need a break. When we honk at one another we would do well to make sure it is to encourage, help and cheer on, rather than hurt, taunt and discourage one another. 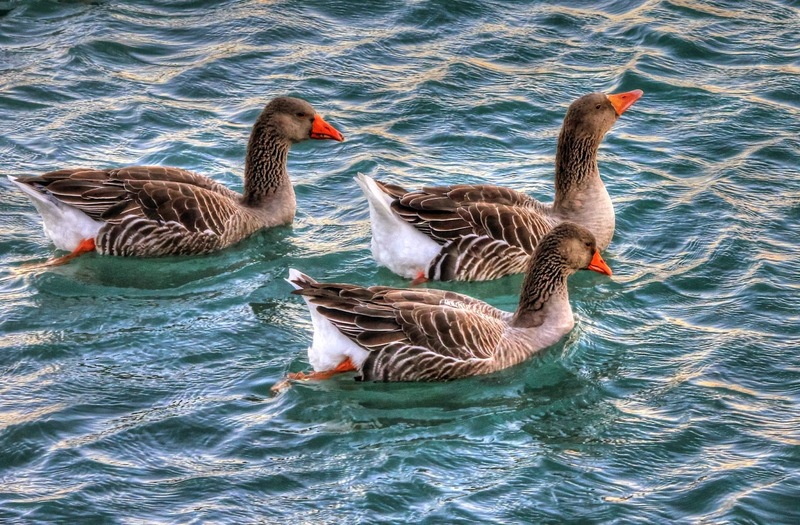 When one of the geese falls ill, or is shot down or injured by a predator, two other geese instantly leave formation. They stay with that goose to help it until it is well or until it dies, so it is not alone. Afterwards, they rejoin the original formation or join with another formation. Father, Son & Holy Spirit; a three strand cord is not easily unraveled. Even the geese know this principle! OH that we who call ourselves Christians would have as much sense as a silly goose does! What's the first thing you do when you move to a new place, perhaps a different city or another state? Right - I had to find replacements for all the services I'd enjoyed in my previous living place. Hair Salon - and this is where the story gets interesting. Everyone knows that the main event in any hair salon are the stories that are shared. Stylist to client, client to stylist, stylist to stylist and so on. I can't imagine sitting in a stylists chair and not asking about their life or answering questions about my own. I'm sure that happens, but I'm guessing not very often. I saw a salon that had a very bright and colorful sign at the roadside. Okay, so how do you pick a new hairdresser when you don't know anyone in town yet? I liked the name, I liked the colors and it was convenient, right on my way to and from my new job. I dropped in one afternoon, met a very nice woman and made an appointment to have my hair cut. For the next year or so I went fairly regularly and the woman, who turned out to be the shop owner, cut my hair, sometimes the same style, and sometimes we experimented. But every time we talked. I asked about her life. I asked about her family. I listened as she shared about her husband and the ups and downs of family life. I listened as she spoke about her concerns for her children and raising them well, making good decisions for them and choosing the best course of action in any given situation. Through it all, I offered my thoughts and opinions. I shared biblical principle's with her on a regular basis, though I seldom actually quoted the bible. I shared wisdom from Proverbs and Psalms, encouraged her in every way I possibly could and shared stories from my own life that exampled some of the things I was sharing with her. Until the day when we'd gotten comfortable with each other and had established an easy friendship that included a sense of trust. She had some serious questions about a few serious matters occurring in her life. I made it clear the serious answers were found in Jesus, She listened attentively. She didn't feel comfortable accepting an invitation to church. Shortly after that, I was moving on once more to continue the ministry work I was called to do. On my last visit to her shop, I brought with me a bible, where I had inscribed a message of hope on the inside. Several years went by and once in while, I thought about her and prayed for her. Then we had occasion to visit the area again, as we'd been invited by my husbands childhood friend to visit a new church he was involved in planting. As we worshiped in song that morning, I kept thinking to myself that I knew the woman sitting in the front pew, glorifying God with passion and sincerity. All through the service I admit I was slightly distracted, trying to place where I knew her from. When the service had concluded, our friend asked us to come to the front and meet his new Pastor, which we were glad to do. We shook hands and praised God at this new and needed work to bring the Gospel message to this town. And then I turned around. "You were right," she told me, "all the answers I needed were in here." I cried as we hugged and caught up with each other. Seemingly insignificant acts committed in the love of Christ transform people dead in trespasses and sins to new creations with Eternal Life in Christ Jesus. THAT IS HOW GOD WORKS! *This is a true story! We dress it down, cover it up, smooth it over and do whatever it takes to make it easier to swallow. The truth is that we can't handle the raw, unvarnished, unimpeachable, immovable, immutable eternal truth. Because truth isn't our version of a story, or how something is presented to us. It most certainly isn't "relative" or personal to each individual. It isn't what you think it is or what I think it is. No truth is found outside of Jesus. We can deny the truth, but we can't change it. You can ignore it but it exists eternally with or without your acknowledgement. You can heap abuse on it but it stands proud and tall. It seems so simple really. And quite unbelievable. Unbelievable because we - you and I - could never, would never give so freely and completely and unselfishly of ourselves as Jesus did for us. 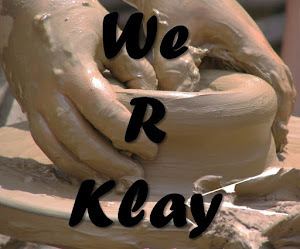 We can't because we are sinful weak flesh. He can and did because He is the Holy, Just, Righteous, Gracious, Merciful Creator of all heaven and all and everything in it. We can argue that there are contradictions in the Bible - oh wait, no. I won't argue with you, because I can see for myself that there are apparent contradictions. I remember that the bible is a translation made by men who may or may not have rearranged a few words to suit their own theology. You may even "disprove" the Bible or parts of the Bible. Again, mans translations, what can you do? It remains unchanged, sometimes unfathomable but always faithful to those who will simply accept it. God created. We need Him. Our need is so overwhelming and all pervasive that we cannot even see it sometimes. He Loves Us. So He came in the form of Man, Jesus, the Son of God, to redeem mankind from Sin. You don't have to join a monastery, live in a cave give away everything you have or behave in any silly, undignified manner. and He answers. Look for Him, as He is the Answer, and you will be found. That's His promise. Every year at this time we encourage you to join with us and countless others around the world in consuming DAILY the Words of Life that will transform, inspire and uplift you. Visit the Daily Reading page, print out your calendar and begin reading. We eagerly await your tales of change and growth! We know they will occur, because our lives have changed so drastically as a result and continue to change each day, each year. MAY GOD HIMSELF BLESS AND KEEP YOU UNTIL THE DAY OF THE GLORIOUS APPEARING OF HIS SON JESUS THE CHRIST TO GATHER HIS SAINTS. 2015 - LIGHT IT UP!